The SMOK brand has a reputation built on its legendary innovation, dedication to quality, and impeccable eye for style. There’s a SMOK device for just about every vaper, and the brand’s full product lineup includes no shortage of vaping community favorites. 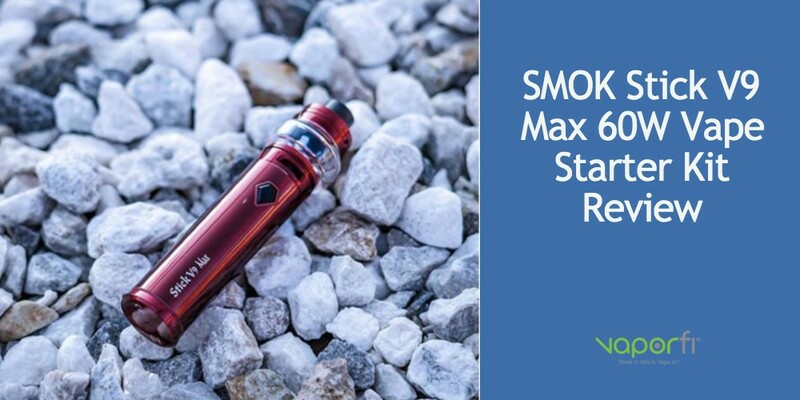 Here at VaporFi, many of our top-rated vapes carry the SMOK name, so we weren’t surprised at the anticipation surrounding one of their newest product debuts: the SMOK Stick V9 Max 60W Starter Kit. 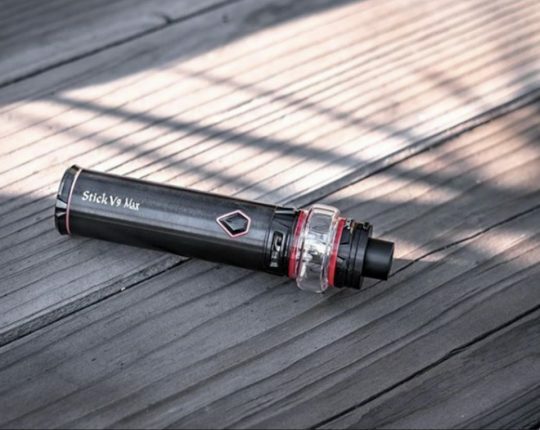 Promising power, performance, and serious cloud chasing potential in a sleek and compact pen vape, the Stick V9 Max has already established a loyal following despite its very recent release. 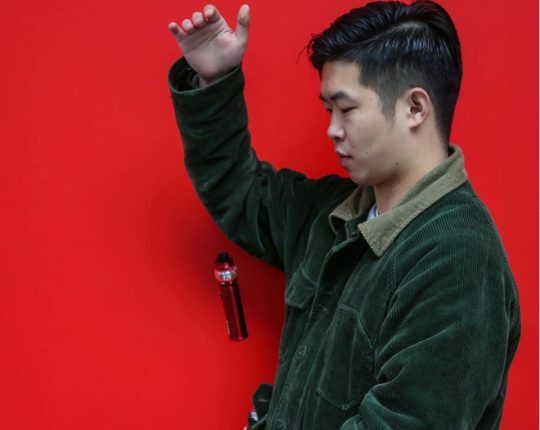 In keeping with the VaporFi tradition of testing and reviewing the most exciting new products on the vape scene, our team decided to find out if the Stick V9 Max truly lives up to all the hype. Spoiler alert: It most definitely does. 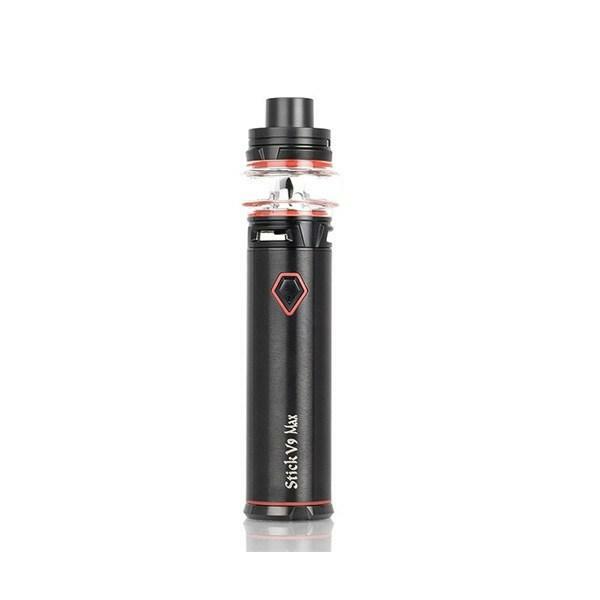 The SMOK Stick V9 Max 60W. 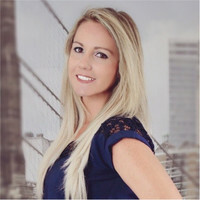 One of the biggest benefits of owning any SMOK vape is the impeccable construction, style, and manufacturing quality, setting their devices apart from many others on the market. The Stick V9 Max continues this legacy with stainless-steel construction and a design that leaves no detail forgotten. There are no large screens or excessive buttons cluttering up the overall look, with a minimalist approach taken with the overall design. Single-button operation is delivered in the form of an attractive hexagonal firing button, which is a nice change of pace from other, more commonly seen shapes. Though the Stick V9 Max is slightly larger than its predecessor, clocking in with a 28-mm base diameter, it’s definitely still compact and lightweight enough to easily take on the go. You can choose from a familiar lineup of classic SMOK colorways, including prismatic rainbow, black, red, blue, and stainless steel. 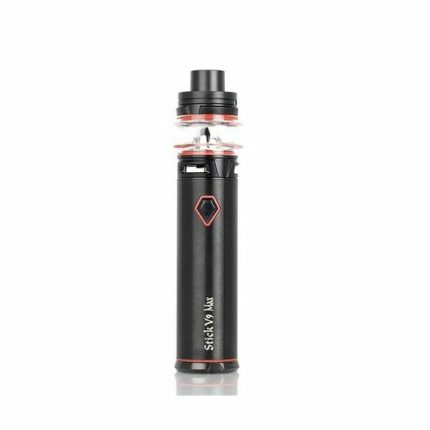 Subtle orange accents and the understated log make the vape an easily recognizable member of the SMOK family, and will likely have your fellow vapers interested in your cutting-edge device. All components come together easily and securely, and it’s clear that they were designed for the perfect fit. 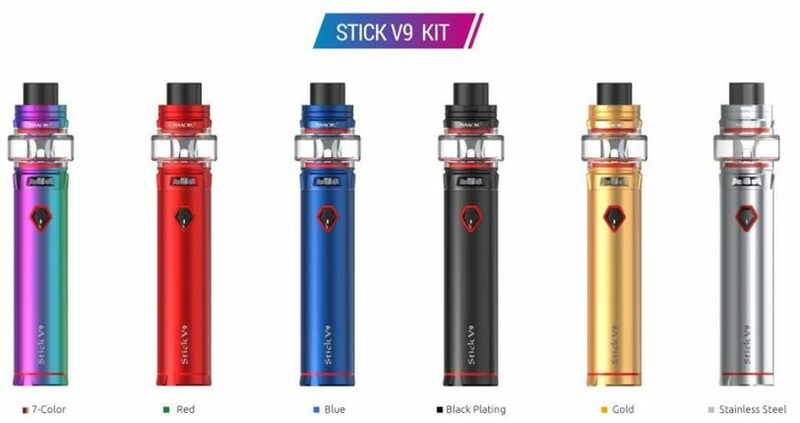 Buy the SMOK Stick V9 Max Kit! It’s no secret that finding a truly powerful pen-style vape can be tough – there are options out there, but it’s rare that you’ll find options to compare to larger, high-powered mods. However, the SMOK Stick V9 Max takes vape pen performance to the next level with a stunning 4000mAh battery and 60 watts of output power. A smart, mechanical-style direct voltage output system harnesses this fierce power and provides optimal performance, working in perfect tandem with SMOK’s advanced Baby V2 mesh coils (included in the kit). You can choose between the kit’s 0.15-ohm Baby V2 S1 Single Mesh Coil or the 0.15-ohm Baby V2 Quad coil, both offering intense flavor and excellent vapor production. Having the flexibility to customize your vape experience using the performance-grade TFV8 Baby V2 coil system is yet another of the many benefits to this kit. Even though the SMOK Stick V9 Max is a force to be reckoned with, you won’t have to struggle to enjoy a laidback, satisfying vape. Genius engineering takes care of all the work, making this vape particularly user-friendly. Plus, thoughtful design features like SMOK’s signature safety protections (including the mod’s explosion-proof, high-temperature resistance and its tank’s lock button mechanism) will help keep you and the Stick V9 Max safe and happy. Refills are few and far between with the tank’s incredible 8.5 mL e-juice capacity. When it does come time to top off your juice, the top-fill rotary design minimizes annoying spills and makes the process quick and painless. The SMOK Stick V9 also has an exclusive 16-mm wide Delrin wide-bore drip tip, providing the ultimate in comfort. If you want to upgrade your vape to a level you’ve probably never even dreamed of, look no further than the SMOK Stick V9 Max. This mid-priced vape pen is an outstanding example of brand innovation, vaper-centered design, and high-quality engineering, and it’s absolutely worth the investment. Does the SMOK Stick V9 Max Starter Kit sound like a vape you’d like to add to your collection? VaporFi offers this top-selling SMOK favorite and hundreds of other top-quality vapes, all at great low prices and shipped completely free. Whatever style of device you’re looking for, whether it’s an uber-advanced mod or a fuss-free e-cig, you can find it right here at VaporFi. Plus, our online shelves are also stocked with e-juice options in thousands of flavor combinations, so you can make the most of your favorite vape device. If you can’t decide where to start your vape shopping list, we’ve put together handy product guides that break down the best options in every category, offering up great choices for vapers with all experience levels, preferences, and budget. Browse our site for more product reviews or contact our customer support team for answers to all your vape questions anytime. Introducing the Volt Hybrid Tank! What Is The Difference Between a Regulated MOD and an Unregulated MOD?